Buying a new home is exciting, but after the euphoria wears off, it’s time to start thinking about how to pack up and move everything. Unless you have the luxury of hiring a moving company, getting all of your things loaded carefully and transported from one place to another is a major DIY project. Here are some tips to take some of the anxiety out of packing. Start deep cleaning and cleaning out as soon as possible. Cleaning your things as you pack them will make it easier when your bone-tired from loading and unloading. Have a throwing out party. Calling it a party will get the kids involved and make it sound like a good time, right? Have a garage sale for items that may not fit in your new home or you have out grown. Call donation centers to pick up items you are not taking with you or donate them yourself. Time to box it up. 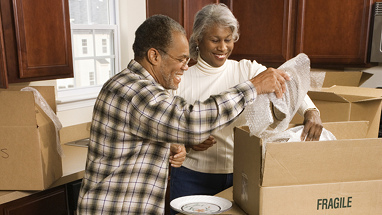 Start gathering sturdy boxes or reusable storage boxes, and lots of newspaper and/or bubble wrap. Keep everything safe. For your kitchen items, ball up several sheets of newspaper and cover the bottom or the box. This provides a cushion for your breakables. Wrap it up. Use blankets, sheets and towels to keep framed photos and artwork safe. Clothes are best left in their dresser drawer–just remove the drawer when you’re moving the main part of the furniture, then replace them when it gets to the truck or trailer, and new room. Hanging clothes can be placed in a flat sheet. Lay the clothes, with their hangers, onto the sheet. Tie up each corner diagonally to create a big hobo pouch, and the knots can be a handle. Unless you’re lucky enough to have tons of luggage, it’s an easier way to transport those clothes than trying to hold all those hangers on your hand. Not to mention less painful. Luggage can be used to pack up items you consider priceless. Just pack them in the same manner as you would have in a box or container, and that way you can keep a better eye on them or move them yourself. Bare necessities. Make sure each person packs their own bag of clothes and any necessities they will need for a few days. The first week in a new home can be a bit confusing, and if everyone has what they need close by, this will make things easier. The big stuff. Furniture is straightforward. If you want extra protection, use an industrial roll of plastic wrap, or for tables and chairs, use a large blanket or some towels on the seats or tabletop to protect the finish. Glass table tops and mirrors need to have some crisscrossed masking tape on them to help protect them from shattering–think hurricane-style. Use hair ties to keep cabinet doors closed on hutches or entertainment center doors. Get yourself together. After everything is boxed up, taped up, labeled and ready to go, leave the boxes in the rooms they belong in. Remove things from the truck by room, and make sure the containers get to the rooms they’re labeled for. Preparing to relocate can be daunting, but if you use some common sense and think practically, you can cut down on the stress of moving. Organization is the key!